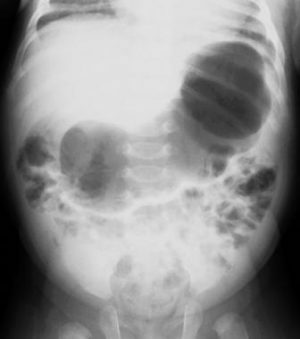 A case report of Infantile Hypertrophic Pyloric Stenosis with Caterpillar Sign by Dr.Bruno Martinez-Leo and associate has been published in NEJM. A 23-day-old male infant who was brought to the emergency department because of nonbilious vomiting that had increased in frequency over a period of 5 days. Findings from the clinical examination were notable for mild dehydration and a possible olive-sized mass, approximately 2 cm in diameter, that was detected on palpation of the abdomen. An upper gastrointestinal radiographic series was obtained (ultrasonography was not readily available as the initial test), and the findings showed a distended, air-filled stomach with undulating contours, known as the “caterpillar” sign. This sign is visible when active hyperperistaltic waves come to an abrupt stop at the pylorus — a finding that is suggestive of hypertrophy. Abdominal ultrasonography was then performed, and the results showed a pyloric wall width of 4.5 mm, a pyloric diameter of 25.0 mm, and a pyloric channel length of 24.0 mm. Given that a pyloric wall width of 3 mm is considered to be the cutoff for the normal range, the 4.5-mm value in this infant confirmed the diagnosis of infantile hypertrophic pyloric stenosis. The infant underwent an open pyloromyotomy and had no complications from the procedure. He was discharged home 2 days later and was able to receive full feedings. At follow-up 3 months later, he remained well.